PATNA: A Union BJP minister from Bihar has triggered a storm in political circles by suggesting rival leader Rabri Devi to remain covered in veil. “Rabri Devi is our bhabhiji (sister-in-law). She should remain covered in veil,” Union minister Ashiwini Kumar Choubey told the media on Saturday while campaigning for NDA candidate in Sitamarhi. मनुवादी भाजपाई गुंडे घृणित मानसिकता के महिला विरोधी लोग है। ये भाजपाई मानसिक रूप से विक्षिप्त जीव है। पता नहीं घर में अपनी माँ-बहन,बेटी को कैसे सम्मान देते है? 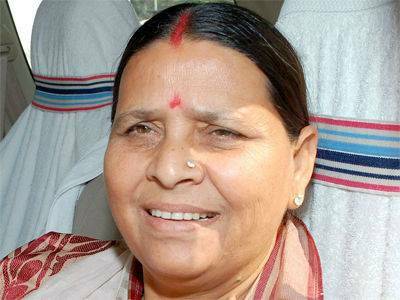 Rabri Devi, former Bihar chief minister, is wife of jailed RJD president Lalu Prasad. “Why do you hate women and have so much fear from them? Is it the kind of the women empowerment Prime Minister Narendra Modi had been talking about? Is it the true face of “Beti bachao, beti padhao” campaign?” asked Rabri. She added that Choubey should first suggest his party ministers such as Smriti Irani, Nirmala Sitharaman, Sushma Swaraj, Menka Gandhi and Vasundhara Raje to remain in veil.